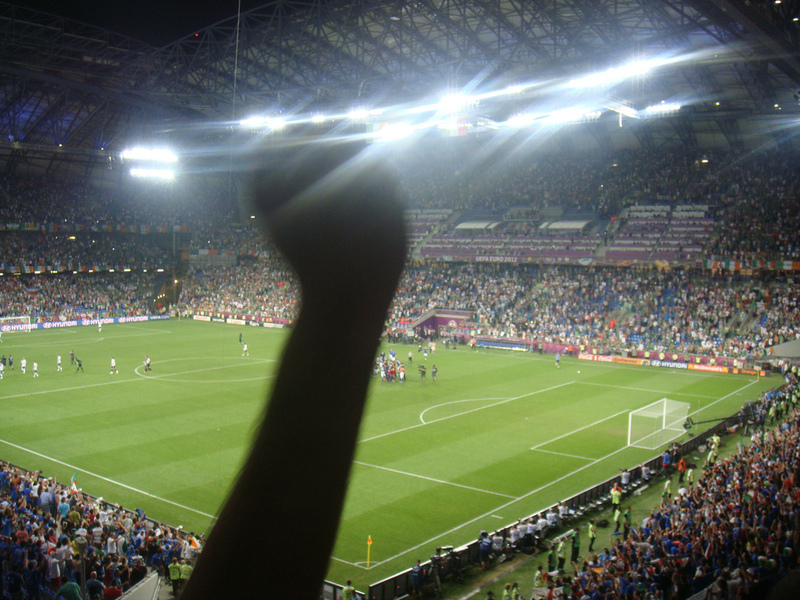 Euro 2012 has concluded this morning with Spain’s 4-0 victory over Italy in the Final. Spain were ranked 1 in the FIFA Rankings prior to this Tournament. They were the defending Euro Champions and the World Cup Champions. Italy were ranked 12 in the FIFA Rankings. 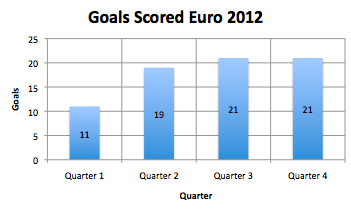 Seventy-six goals were scored in the whole Tournament. Sixty goals were scored in the Group Games (Matchdays 1, 2 and 3). 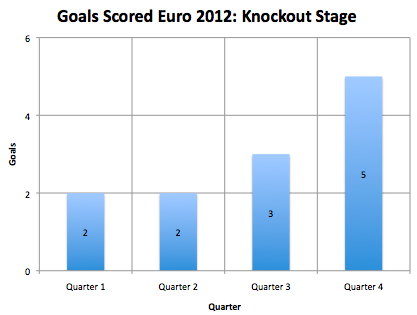 Sixteen goals were scored in the Knockout Games (Quarter Finals, Semi Finals, Final). 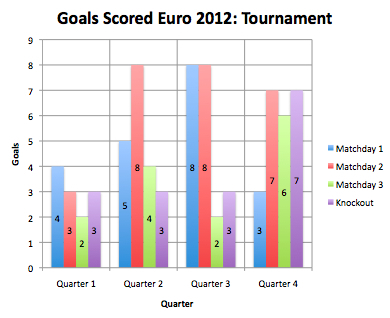 There were two penalty shoot outs after both games ended 0-0 after extra time (England v Italy, Portugal v Spain). The goals in the Tournament were scored in the following quarters of the game (0-22 minutes (Quarter 1), 23-45+ (Quarter 2), 46-68 (Quarter 3), 69-90+ (Quarter 4)). The Euro 2012 Football Tournament has reached the Final game. FIFA published its rankings on 6 June before the start of the Tournament. The Final will be played between Spain (ranked 1) and Italy (ranked 12). 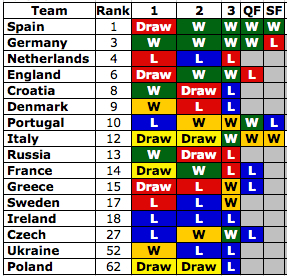 Netherlands lost three times, two of these losses were to lower ranked teams. 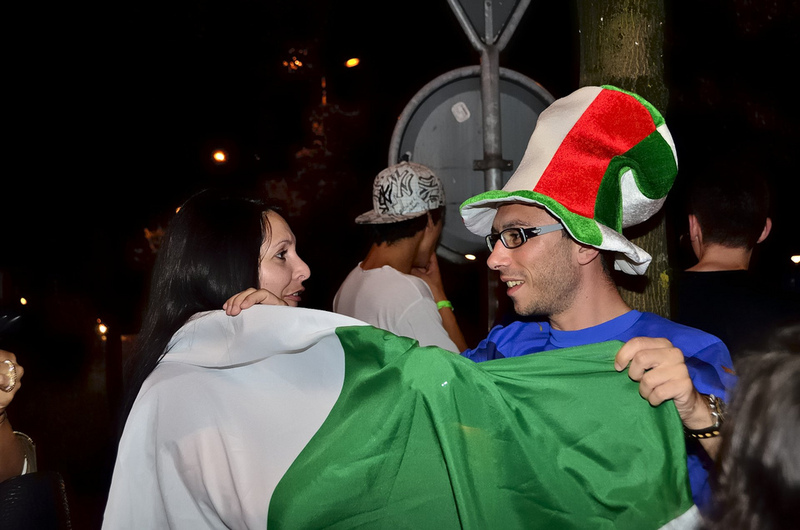 Italy played above its ranking status. The two host nations played above their rankings in three of the six games. The Semi Final Stage of Euro 2012 has concluded. Three goals were scored in the Semi Finals All three goals were scored in the second Semi Final. 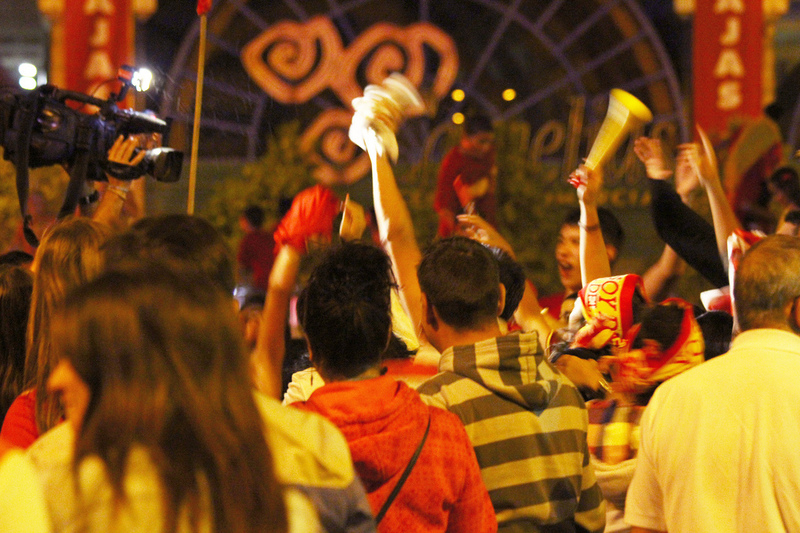 The first Semi Final between Spain and Portugal was decided by a penalty shoot out. 72 Goals have been scored in the Tournament to date.